I bought a couple Rubbermaid coolers to use for my All-Grain brewing, but the one thing they didn’t come with was a thermometer. 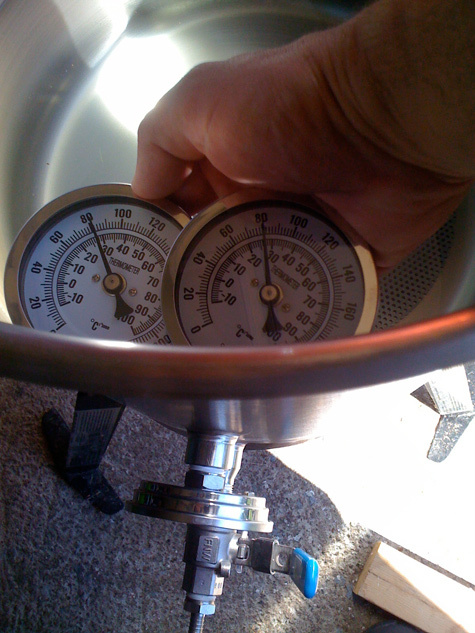 I had been using a digital probe thermometer until one brew session the temp was off by over 30 degrees. last time I checked water doesn’t boil at 185° in New Jersey. So after a bit of searching on the internet for cheap ways to add a thermometer, I found a forum on homebrew talk that used a rubber stopper and a simple probe thermometer to inexpensively solve this problem. First Calibrate the thermometer(s). it is easier to do before the probe is on your mash tun or hlt. Next, find where you want to place the therometer, make sure that it is in a location where the liquid will cover the probe, even with your smallest beers. 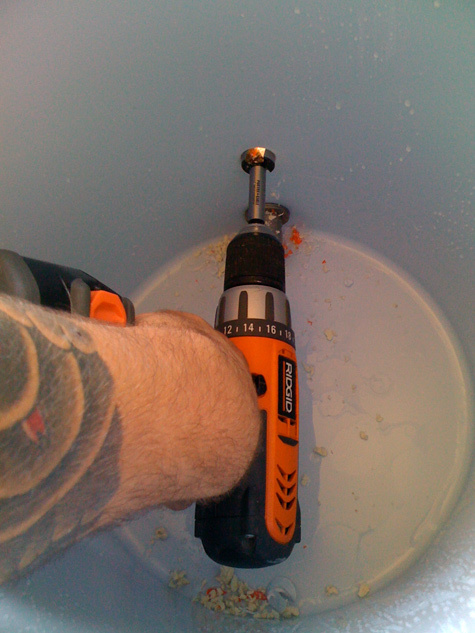 Using the 3/4″ hole bit drill a hole through the outer skin of the cooler, then switch and drill from the inside out. This will way you’ll be less likely to crack or break the inner shell of the cooler. Next drill a hole through the solid stopper with the small bit. You want it to be a tiny hole, the rubber will expand enough to get the probe through, but not enough to allow for a leak. Finally put the probe of the thermometer through the cooler, and into the small end of the rubber stopper. The rubber stopper will go small end into the inner wall of the cooler. Keep pushing the stopper onto the probe and into the wall of the cooler until the fit is snug and the thermometer is up against the outer wall of the cooler. Test for leaks and brew! Good tutorial, peter. 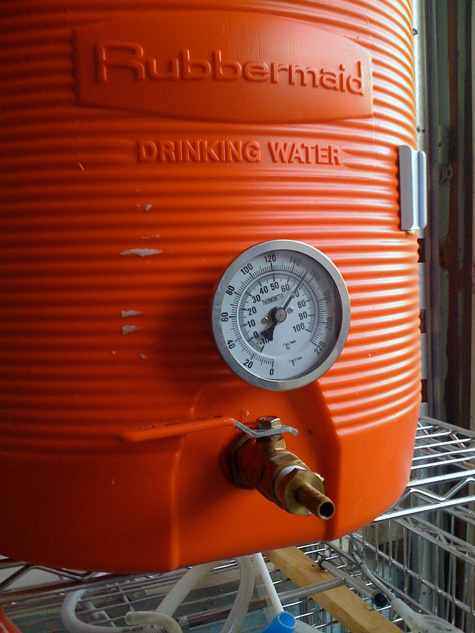 I’ve added stainless ball valves, just not thermometers. I picked up a high temp O-ring kit at Harbor Freight for twelve bucks…it came with over a hundred O rings that can handle temps up to 400C, so when money isn’t as tight, I want to add a thermometer to my tun and my boil kettle. A word on calibration…my last couple of beers have been thin with no residual sweetness. Blah. I thought I was loosing my touch. Turned out my thermometer was SIXTEEN degrees off. Lesson learned. Thanks Nate! Ouch, 16 deg, high or low? I was sick of my temp probe being off, so having a good thermometer on ever piece of equipment is nice. 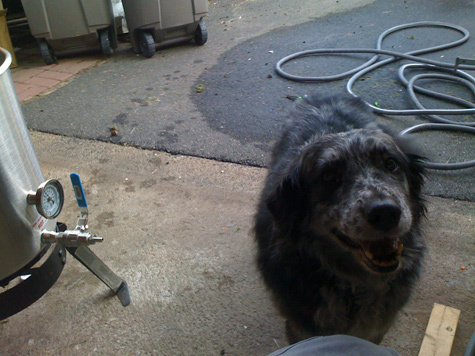 I also calibrate them every couple of months, but haven’t had to make any adjustments so far. Great tutorial. 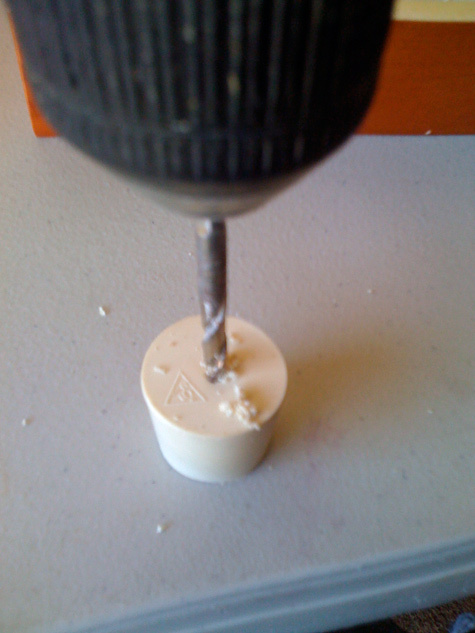 I didn’t know that you could drill through the rubber stoppers so easily. The last time that I asked about it at the homebrew shop, for some reason they recommended against it. I think I’ll build one of these for my next batch. Thanks David. 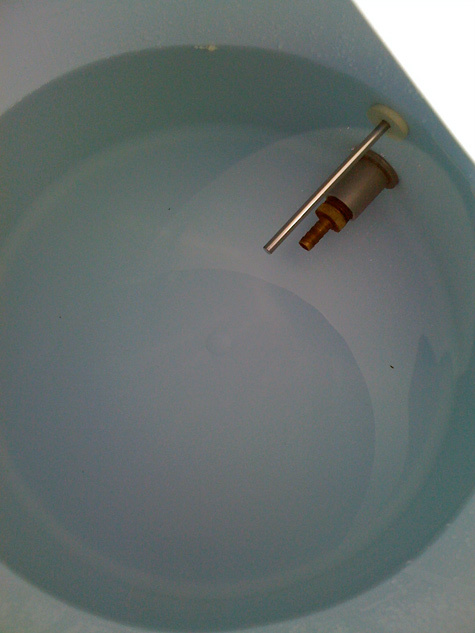 I’m actually going to use the same method to run my fly sparge through my cooler lid. It has worked great for my temp gauges. About 10 batches since w/o any problems. Thanks for posting this! I got my mash tun together, and I’m prepping to follow your instructions to add a thermometer to it. I think it will go a long way in helping reach my proper mash temps. Thanks again for posting man. Andy, you want to have the stopper bigger then the hole or it won’t plug. A hole bit will make a nicer edge, but should be able to use a regular bit if that is what you have. I used a forstner bit for mine. That bit will be perfect. It’s a 3/4″ Forstner Bit, and I think it might be the same one you used. This will work okay? Any idea if there are places that will sell this stopper without having to order online? Hi Sean, most Home brew stores sell the solid bung. Thanks Nate for your post, I like your idea. I’ve purchase all the items you’ve listed, however I have a couple questions. You mentioned to push the thermometer up against the cooler. Do the threads on the back of the thermometer go into the hole? Also, do you think this will work on a 5 gallon (home depot) cooler for my hot liquor tank? The space between the walls would seem to be too close. Thanks again for your post and time. Greatly appreciated.